What is Bronchitis and Pneumonia? Bronchitis is an infection or irritation of the bronchi—the passageway from the windpipe (trachea) to the lungs—while pneumonia is an infection or irritation of the lungs. Both of these conditions are much more common in the winter, as they usually follow an upper respiratory infection (cold). WARNING: Symptoms of bronchitis or pneumonia, including a persistent cough, may indicate a serious condition. Consult your physician if you have symptoms suggestive of pneumonia or if a cough persists for more than one week; if it recurs; or if it is accompanied by high fever, rash or a persistent headache. Signs and symptoms of bronchitis include bouts of coughing, shaking, chills, fever and chest pain that are usually preceded by an upper respiratory tract infection (cold). Pneumonia differs from bronchitis in that it shows the classic signs of lung involvement (shallow breathing, cough, abnormal breath sounds), and a chest X-ray shows infiltration of fluid and lymph into the lungs. Since the two are difficult to distinguish, please consult a physician if you are experiencing any symptoms suggestive of pneumonia. What Causes Bronchitis and Pneumonia? 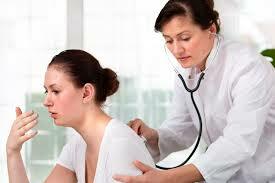 Bronchitis can be caused by a variety of microorganisms, especially viruses and bacteria. In healthy individuals, bronchitis most often follows an insult to the immune system. Viral infection (especially influenza or the common cold), cigarette smoke and other noxious fumes, loss of consciousness (which depresses the gag reflex, allowing the breathing in of fluids), cancer or hospitalization (due to increased exposure to organisms that can cause pneumonia) are all risk factors for bronchitis and pneumonia. Which Dietary Factors are Important in Bronchitis? Optimal immune function requires a healthy diet that is (1) rich in whole, natural foods, such as fruits, vegetables, grains, beans, seeds and nuts; (2) is low in fats and refined sugars; and (3) contains adequate, but not excessive, amounts of protein. On top of this, drink five or six 8-ounce glasses of water per day (preferably pure water). These dietary recommendations go a long way in helping the immune system function at an optimum level. Please see low immune function for more recommendations. Which Nutritional Supplements Should I Take for Bronchitis? Lung, Bronchial and Sinus Health from Natural Factors is designed to provide key nutrients and herbal extracts for healthy airways. For example, it contains N-acetylcysteine (NAC)—a derivative of the naturally occurring amino acid cysteine. NAC directly splits the sulfur linkages of mucoproteins, thereby reducing the viscosity of bronchial and lung secretions. As a result, it improves bronchial and lung function, reduces cough and improves oxygen saturation in the blood. Adults and children older than 12 should take one tablet three to four times daily. Children ages 6 to 12 should take one tablet up to three times daily. Lung, Bronchial and Sinus Health is not for children under 6 unless recommended by a physician. Echinamide: A patented, clinically proven, super-extracted Echinacea purpurea liquid that guarantees high levels of the three key active groups of compounds responsible for echinacea’s actions on the immune system. Astragalus (Astragalus membranaceus): The most famous herb in Chinese medicine for strengthening the immune system is now backed by scientific evidence. Lomatium (Lomatium dissectum): This herb garnered attention during the Spanish flu outbreak of 1917, after it was discovered that Native Americans were recovering from this flu much quicker than everyone else. Reishi (Ganoderma lucidum): Referred to in Chinese medical texts as “the mushroom of immortality,” reishi is valued by modern herbalists for its ability to promote resistance during times of stress. Licorice (Glycyrrhiza glabra): A valued, time-tested herb noted in recent scientific investigations for its antiviral properties. For immune support during acute viral infections, take 50 drops of Anti-V in water, or two capsules every two to three hours. For long-term support or prevention, take 50 drops in water or one or two capsules two times a day, or as directed by your healthcare practitioner. One of the main treatment goals in cases of bronchitis, sinusitis and pneumonia is to help the lungs and air passages get rid of excessive mucus. In an effort to assist this process, here are directions for an old-time therapy called postural drainage that works absolute wonders. I recommend you do it twice daily until the bronchitis has resolved. Apply a heating pad, hot water bottle or mustard poultice to your chest for up to 20 minutes. To make a mustard poultice, mix one part dry mustard with three parts flour, then add enough water to make a paste. Spread the paste on thin cotton (an old pillowcase works well) or cheesecloth, fold it and place it on your chest. Check the poultice often, as mustard can cause blisters if left on too long. After you’ve applied the poultice, heating pad or hot water bottle, perform postural drainage by lying face down on a bed with the top half of your body off the bed, using your forearms as support. This position should be maintained for five to 15 minutes, while you try to cough and expectorate into a basin or newspaper on the floor. A lessening in the severity of symptoms such as coughing should be apparent within the first 48 hours. If not, please check with your physician.